Mi piace molto e lo faro’! Grazie , dev’essere eccellente (e non difficile) ! No apologies needed for me…I’m all into this dish! Great presentation and simple preparation. Nice to see you back in the kitchen! It’s good to be cooking! We love our pork fillet in this house! It’s very popular in Spain, though it seems to be a bit overlooked here. I,m drooling all over my keyboard. This dish looks heavenly! 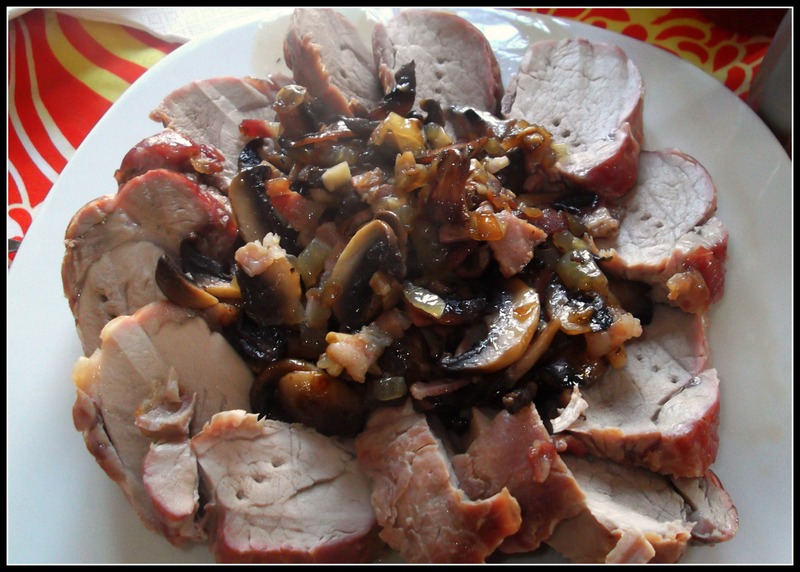 Pork/mushrooms/wine – lunch: today – marvellous 🙂 !! Oh, the rosemary was there 🙂 ! When last did I use the scrummity – fabulous taste explosion flavourful dinner. Ah, the loveliest vegan in the world – that’s you Miss Narf7! This made me doubly smile as I like to be “tootin’” when I can and…when I lived in South London I lived in Tooting Broadway!! This sounds so good…I have everything except the mushrooms. I may be heading the the market later. Off to the market for you! Even though your dishwasher is back up to speed, the less washing up the better I find! I love porky dishes and this one looks mighty fine! We eat a lot of pork in Southern Spain and this is a favourite! Mrs. Chica why not use ingredients beef but why use pork? He said pork is not good for health because it contains tapeworm in his flesh . I’m afraid I don’t agree. Pork is widely reared, consumed and enjoyed in Spain. Beef is not available easily in southern Spain. can we change with beef? I think it would be amazing with beef fillet!